This Valentine’s Day REALLY give your heart! Images of red hearts can be found everywhere. Love is in the air as Cupid targets his next couple. People buy cards, flowers, chocolates, and gifts to show appreciation to those in their life, whether it be a love interest or friendship. It’s Valentine’s Day. A heart is a symbol of love which is why it is used to represent Valentine’s Day. But did you know that a heart is also the hardest working muscle we have in our body? When it is damaged it can affect our quality of life and even cause death. There are several reasons this muscular organ can become impaired. Heart disease, heart attack, artery disease, and birth defect of a newborn baby are just some of the ways a heart can become damaged beyond repair. What is needed then is a new heart. The key to saving the lives of these patients is a heart transplant. A heart transplant is a surgical procedure in which the diseased heart is taken out of the patient. It is then replaced with a healthy heart that has been taken from a deceased organ donor and implanted into the patient. Right now there are over three thousand people waiting for a heart transplant. Many are young children and babies. Averages of eighteen people die each day waiting for a donor heart. Eighteen people each day! The main reason these people die is due to a shortage of donor organs. This may mean nothing to you if you and everyone in your life is heart healthy. But what if……what if you or someone you love needed a heart transplant? I believe your outlook, if you are against organ donation, would change. Each year an average of two thousand heart transplants are performed in the United States. The lives of these heart recipients were saved by noble acts of kindness from humanitarian individuals who believed in the gift of life. 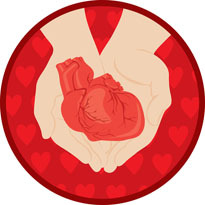 As cards and gifts from the heart are being distributed this Valentine’s Day please take a moment to remember those who are waiting for the ultimate gift of unconditional love….a donor heart. This Valentine’s Day REALLY give your heart. Become an organ and tissue donor. This entry was posted in All, Awareness and tagged heart attack, heart transplant, heart transplants, organ donor, Valentine’s Day, waiting for a heart. Bookmark the permalink. ← The Coca-Cola Commercial “It’s Beautiful” Was Just That! !